Last year, US Nuclear and MIFTEC announced a revolutionary and patented new way to make billions of dollars of radioisotopes from fusion energy at half today's cost. Since then, US Nuclear's exclusive partner, MIFTEC, has decisively proven at UNR TeraWatt Facility that their radical new fusion technology works exactly as predicted. MIFTEC hired a leading nuclear fusion design engineer from a National Lab and has already completed design plans for the first commercial 10MA LTD-X (linear transformer driver) Staged Z-Pinch Fusion. Suffering from severe shortages, the medical radioisotope market is $10B annually and could be at least double if the supply was bigger, more reliable, and if the cost was lower. Radioisotopes made from fusion power are about half the cost of radioisotopes currently made by fission reactors. US Nuclear and MIFTEC are the only companies in the world that are able to use MIFTEC's breakthrough fusion power to make abundant high-quality radioisotopes at half the cost. The closest competitor has only been able to generate 1/100,000ththe power that MIFTEC has already demonstrated. Medical radioisotopes are in big demand because they are the best-known tools for diagnosing cancer and heart disease and for treating about half of all cancers.Currently, radioisotopes are largely made in only 5 large nuclear fission reactors that are very costly, hazardous, subject to unexpected shutdowns, produce dangerous long-term nuclear waste, and are all outside of the United States. Worldwide shortages are already impacting the quality of healthcare globally and experts warnaboutthe likelihood of further deterioration until a major new source for supply comes on line. Last year, the Chalk River fission reactor in Canada that was one of the largest suppliers of radioisotopes, shut down permanently and is now being demolished. Last year, US Nuclear (OTC: UCLE) shares ran from $.40 to $5.00 when the company announced that their partner, MIFTEC Labs discovered and patented a revolutionary new way to make abundant high-quality radioisotopes. Since then, US Nuclear shares quietly drifted back to where they started, but recently began moving up again to around $1.20 where investors are getting a second chance to get in at bargain share prices. Recently, Emerging MicroCaps interviewedJerry Simmons, CEO of MIFTEC Labs and Bob Goldstein, CEO of US Nuclear to learn more details about their progress and where they stand today. The interview strongly suggests the reason why US Nuclear shares are moving up again and why they appear destined to break the old high of $5.00. Perhaps this run will go higher because their milestones achievements have removed the biggest barriers to successfully becoming a major player in this unfilled, high-need, multi-billion-dollar market for essential medical radioisotopes. When asked what the biggest milestone achievements have been since they first announced their breakthrough technology last year, Jerry Simmons said, "In the second half of last year we did what nobody else has ever been able to do. Not even the big government projects. We made history by generating Neutron Flux in excess of 1010 from fusion power using an isotope of hydrogen from seawater instead of radioactive enriched uranium. This proves beyond any doubt that our machine can make the isotopes used in nuclear medicine (i.e. 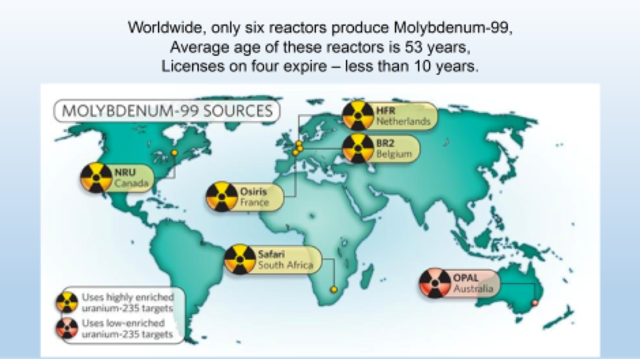 Mo-99, Tc-99m, cobalt 60, iodine, etc.). It is only a matter now of simply scaling the power or electric current flow of our machine up so we can achieve the greater Neutron Flux of 1012+. Dr. Hafiz Rahman, President and Chief Scientist and his staff at MIFTEC Labs and the University of Nevada, Reno National Terawatt Facility, tells us that our scientific experimental predictions and the device will work as designed." The pursuit of fusion power has been elusive, and many have heard it for so long, that the common perception is that fusion power is still a long way off. The truth is that it is here now and MIFTEC and their sister company Magneto-Internal Fusion Technologies, Inc. (MIFTI) have successfully achieved the greatest power ever from fusion which is the same nuclear energy process happening in our sun and the stars. The closest competitor known to MIFTEC claims they have achieved a Neutron Flux of 105 from fusion power. To illustrate how far ahead of the pack MIFTEC is, consider that they have already achieved 1010that is 100,000 times more powerful than the closest competitor. Dr. Hafiz Rahman says, "To give you an idea of how advanced we are, when we achieve 1015, it will be 10,000,000,000 (ten billion) times more powerful than 105. That is more than enough power to create all the Neutron Flux we need to supply low cost radioisotopes and power for production of electricity with our compact, low cost machines." Simmons continuing, "The machine we used at University of Nevada, Reno National Terawatt Facility was a 1 MA (1 Mega Amp) machine which limited the Neutron Flux we could generate to 1010. Last year, we hired a top nuclear design engineer and he has already completed the design for our new 10 MA (10 Mega Amps) LTD-X Staged Z-Pinch Fusion Generator that is designed to generate1015 Neutron Flux that is extremely powerful and matches or exceeds the high power of the fission reactors being used today for radioisotope production. Our new generators are small and will fit into a building close to where the radioisotopes will be used. Our generators will be only a tiny fraction of the cost of the huge nuclear fission reactors and linear accelerators, and there will be no long-term hazardous radioactive waste to contend with that is dangerous and extremely expensive. Nuclear fission reactors can cost anywhere from several hundred million dollars to several billion dollars and we estimate that our machine will sell for around 3 to 5 million dollars. 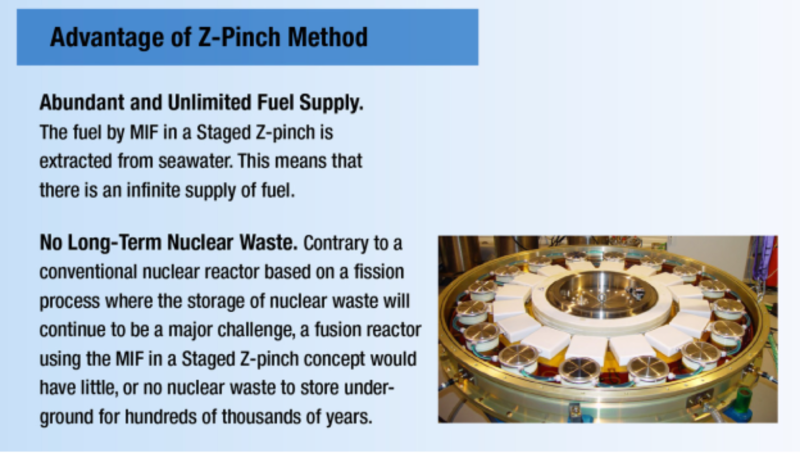 Our Staged Z-Pinch LTD-X Fusion Generator will be small and compact and will require very few people to operate. The bottom line is that we will be able to deliver enormous amounts of high-quality radioisotopes for about half today's cost." Bob Goldstein, the CEO of US Nuclear, graduated from MIT with a degree in Physics and has a degree in Engineering from Stanford. He has authored more than 40 white papers and presentations on radiation measurement and his work has been met and approved by US Federal standards set by the EPA, FDA, and NRC. He also works closely with Los Alamos, Sandia and Jefferson National Labs. His family's first experiences in nuclear physics go back to the 1940's when his father was involved in the historic Manhattan Project that developed the atomic bomb. Mr. Goldstein founded US Nuclear and is known for delivering the most sensitive, accurate and reliable instruments in the world. The quality of their work is confirmed by a list of loyal and repeat customers such as NASA, the EPA, Department of Energy, U.S. Air Force, U.S. Army, U.S. Navy, MIT, Pacific Gas & Electric, General Electric, Lawrence Livermore, Oakridge National Lab and many more. Jerry Simmons is the only person in the world who has founded two fusion energy companies. In 1998, Mr. Simmons co-founded Tri-Alpha Energy that is a now a multi-billion-dollar company with big early investors such as Paul Allen's Vulcan Investments and Art Samburg's hedge fund. The company is now called TAE Technologies. Jerry also co-founded Magneto-Internal Fusion Technologies, Inc. (MIFTI) and MIFTEC Laboratories, Inc. MIFTI has been funded by the DOE/ARPA-E and private investors. Mr. Simmons is very experienced and well connected with government officials that are interested in nuclear fusion based power and radioisotopes that are produced from fusion power sources. Mr. Simmons has negotiated a work package between MIFTEC Laboratories and Oak Ridge National Laboratory. US Nuclear has enjoyed a long-standing financial history of stable sales and profitability, but in 2017 demand for US Nuclear's products began increasing and has continued at a high growth rate since. We saw a sales increase of 50% in 2017 and 2018 numbers are due out soon and are expected to show continued strong growth. Several new large opportunities are blossoming in the underserved radioisotope market, and the environmental monitoring market that is forecastto hit $20 billion by 2021. For example, China is converting all of their coal-fired power plants that are responsible for dangerous polluted air and water, to about 200 fission nuclear reactors that all require the best radiation monitoring equipment in order to insure safety. The Chinese nuclear agency claims that each individual nuclear power plant requires about $8,000,000 in the highest quality and most reliable radiation monitoring devices and has already met with Mr. Goldstein twice last year with the intention of purchasing large orders of US Nuclear monitoring equipment. With World Nuclear Power Organization's forecastfor a growing number of nuclear power plants to produce electricity (none planned to produce radioisotopes), the demand for radiation monitoring devices also grows. Other large opportunities for US Nuclear are their unique products recently offered for radon mitigation in homes and offices and the use of drones to mount their sophisticated monitoring devices. Radon is commonly found in many homes and is one of the leading known causes of lung cancer. Goldman Sachs sees the drone marketgrowing to a very large size by 2020. Drones are the perfect vehicle for carrying US Nuclear environmental monitoring devices for public safety and for national security threats of terrorism that could impact our air or water. In conclusion, US Nuclear is enjoying strong growth from its core business, and on top of that, is well positioned to become a major supplier in a multi-billion-dollar healthcare market of radioisotopes. Goldstein says, "Given the failing state of essential medical isotope production facilities, this first-ever achievement to meet and exceed the 1010 milestone in fusion neutron production could not come at a better time. Additionally, the projected cost savings of up to 50% over the current imported resources; the idea of on-site production; the low cost and shorter time to build the generators, and the environmental benefit of a non-proliferating process that precludes the hazards of fission-based methods; should make for important upgrades ahead in the vital medical isotope supply chain." US Nuclear reports only 17 million shares outstanding translating to a very small market cap of about $20 million. Of the 17 million shares outstanding, management owns about ten million shares. The float is small and based on a number of metrics including sales, the share price is substantially undervalued. Any investor looking at US Nuclear should run the numbers for themselves and calculate what the shares could be valued at if their sales mushroomed to the large numbers that just the radioisotope business can bring. The big question is, "How much of a $10 Billion-dollar market (that is expected to be $17 Billion in 2020), can US Nuclear and MIFTEC own if they can deliver valuable, high demand radioisotopes at half-price? And if US Nuclear generates big sales with only 17 million shares outstanding, how high will the price go? US Nuclear shares appear to be a bargain and poised for record highs in the not too distant future.